So you’ve decided to take the plunge and build a gazebo into your back yard. Great choice! Both pergolas and gazebos reliably add value to your home. Of course, they also do a great job of helping you enjoy your home by giving you a backyard getaway where you can truly relax. Now you just have to figure out where to put the thing. What will you use the gazebo for? This is the biggest determinant. If you want to use it as an outdoor dining room then you probably want the gazebo close to your house, maybe right off of your deck. Most people don’t want to carry food all the way across their yard. Want it is as an outdoor reading, lounging, or napping spot? You might choose a shady area that’s near the corner of the yard, something that puts you as far from the house as possible. Socializing and entertaining? If you have a pool, maybe you put it right by the pool so you can keep all your guests close at your next outdoor party. This is a great option if you plan to put your hot tub inside of your gazebo. Finally, you could choose to make it a focal point. People who do this usually have visions of an elaborate back yard garden. The gazebo gets placed at the exact center of the yard. Winding garden paths may lead up to it, and landscaping is chosen with the intent of showing it off. When the gazebo is a focal point it may not have any other furniture inside it save for built-in benches where people can sit and enjoy the garden. How large do you want this gazebo to be? Of course, the size and shape of your yard will help determine your best bets here. Gazebos can range from 8’ x 8’ to 20’ x 40’. A 20’ x 40’ is something you’re more likely to see at a public park or an event venue than in a private back yard, but it’s been known to happen. Of course, we can take a look at your back yard and make some recommendations. Again, the use of your gazebo will come into play here. Of course, you should always consult with a qualified custom gazebo builder. 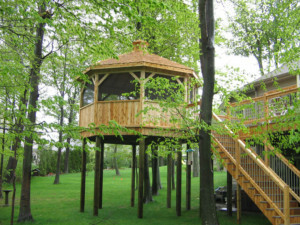 Because we are custom builders we can do things with a gazebo you may never have even thought about. We can show you a wide range of options and solutions for your gazebo. Build it on posts to bring it level with your raised deck? Check. Change up its shape a little bit to help it fit into an odd corner of your yard? No problem. Call us today for a free quote and consultation session. We’re ready to help!